On the sewing end of things, though, there were some fun projects this month. Looking at the mosaic, I'm happy to see that I'm still trying different things. I have a tendency to get stuck in a rut in so many areas of my life, but I would rather not do that here. I've had a ball hosting the Vintage Holiday QAL with all the wonderful people who are following along -- this is definitely going to be one of my favorite quilts, I can tell already. I even have a few other finishes this month that aren't pictured here, but I'm looking forward to sharing them with you in the weeks ahead when I'm officially allowed. And for those of you who haven't yet entered my blog hop giveaway, hurry! I'm picking the winner on Monday morning. Meanwhile, I'm ready to welcome September -- and maybe a few days of weather actually below 100 degrees? -- with open arms. When I held my last job as an assistant principal before I became a stay at home mom, one of my favorite coworkers was our school librarian. She was a sweet young woman who truly enjoyed her work with the students. My friend also had a love for all things vintage, and you would often see her crossing the campus dressed like a Hollywood starlet from the 1940's. I was thrilled to attend her wedding a few years back, and I was just as excited to hear that she's expecting a little girl this November. My sister and I and our five daughters will be visiting her on her lunch break tomorrow, and I wanted to bring her something special for the baby...a quilt, of course. Millie's Closet by Lori Holt for Riley Blake Designs seemed the perfect fabric choice for this project. I knew that my friend would enjoy the retro vibe of the prints, and the colors are girly yet bright. I've always had a weakness for flying geese patterns, and that led to the name for this quilt: Taking Flight. The quilting is simply a few rows of a wavy stitch on my sewing machine which I stretched as long and large as possible. I love the way the fabric, pattern, and stitching all work together to give this a vintage modern feel. The back of the quilt is one of the floral bouquet prints from the collection along with a strip of white muslin. I like using muslin for quilts from time to time; it's so soft and seems to get softer with every washing. For binding, I used Kona Red which ties the whole package together nicely. Step 1: Line your hexagons up in pairs -- these will be the front and back of each hexagon stop on your garland. I tried to match the same colors (or at least get as close as I could) in each pair while checking to be sure that there was a good variety in color and pattern along the line on each side. Step 2: Stretch out your twill tape on your work table, and space out your pairs along the line to your liking. Leaving the paper in the hexie gives it a nice stiffness, and leaving the basting threads in (for now) keeps it from falling apart while you put your garland together. Place some glue on the inside paper of one half of a hexagon pair. Then place it underneath the twill tape in it's new spot, pressing down on the tape to make it stick. Next, place more glue on the twill tape on top of that hexie and then sandwich the other half of the pair on top, pressing down again on top of both. Repeat until all your hexagon pairs are glued to the twill tape. Step 3: Sew just along the edge (about an 1/8th of an inch) inside the border of each hexie pair to secure them permanently to the twill tape. Once all of them are stitched, go back and pull out the basting thread, snipping off any stuck ends as necessary. Step 4: Create loops at each end of the twill tape for hanging. I made mine rather small, but if I were to do this again, I would probably make them larger. Just fold the end of the tape over about a half inch, then fold again about two inches or more to make a larger loop. Stitch over the small folded portion at the bottom of the loop two or three times to secure it. Step 5: Find a fun spot to hang your garland! This version works well either draped over something or hanging down in a straight line. Either way, it's a fun way to decorate with some leftover hexagons. Linking up to the Festival of Hexagons. Today I'll be working with this stack of Millie's Closet charm squares that I cut from a layer cake yesterday. I have two days to whip out a baby quilt for an old friend of mine, and I'm hoping to get most of it done this afternoon. There's still time to enter this week's blog hop giveaway here. I can't tell you how much I've appreciated the feedback that you've all given me about what you'd like to see on Fabric Mutt in the next year. It helps so much to know what's most helpful to you, and my head has been spinning with all sorts of ideas as I've been reading your comments. I'm so excited about the possibilities ahead! Things have been so busy at my house lately with so many activities, errands, and sewing deadlines that it seems like Sunday has officially become "Sew Like a Mad Woman Day." My husband, bless his heart, always gives me a few hours in the late afternoon to work on projects. I'm usually able to get my Vintage Holiday blocks done before dark falls, but this week I just couldn't make it happen. I hope you'll forgive me the indoor pictures taken on our kitchen floor -- it was the best I could do tonight. Block 7 is arguably my favorite block so far -- I just love the way this one turned out. It's a perfect one for fussy cutting, and I loved being able to showcase one of those pretty bouquets from Flea Market Fancy. I've also started saving those four little triangle pairs that you snip off the edges of each ornament block for a later project. 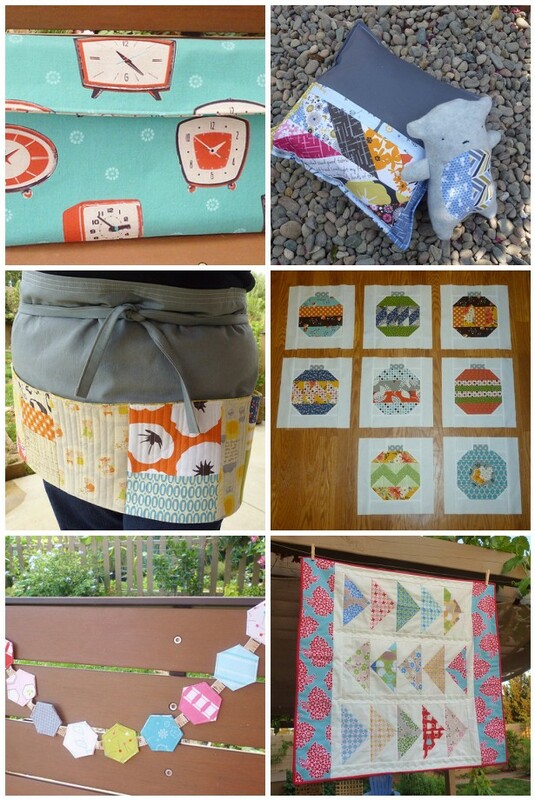 I'm not sure what it will be yet, but I love the idea of using the scraps from this quilt to make something else. Look around the blog -- I hope you'll find something that will be useful to you. You can also find information on the Vintage Holiday QAL, which we started at the beginning of this month. Feel free to join us! For the giveaway, I have a small stack from two of my favorite designers: Melody Miller and Heather Ross. These are all cotton/linen blend fabrics in a mix of different sizes, from a sixteenth of a yard to more than a fat quarter. I don't normally discuss non-sewing related topics on my blog, but I really wanted to link up with Debbie's Tuesday at the (Herbal) Table series, and I figured that this might count. I share this in hopes that some of you might be coming from the same places that I have been. Tonight I closed the door on a special achievement for me. I finished a year long contract with a personal trainer at a local gym. For some people this would not be such a big deal, but for me it was huge. Though I was a normal weight when my husband and I got married, the process of having three children in four years threw me off completely. My weight skyrocketed with each pregnancy, and though I was able to lose about twenty pounds after each delivery, the weight always came back with reinforcements. By the time I was ready to deliver my third daughter, I was in so much pain from the pull on my body that I could hardly walk. After I delivered Mouse, I lost a good deal of weight, but the pounds crept back on again. Between lack of sleep and trying to care for three children under the age of four, I was in a constant state of exhaustion and in no condition to start a serious diet and exercise plan. Honestly, I look back on that year as one of the hardest of my life. By the following year, I took a few months to just read books about health and nutrition, trying to get myself in the right mindset to make some changes in my life. That summer my mother-in-law saw me enjoying myself at the pool near their home, reminiscing about how much I used to love taking water aerobics classes when I was single. After we returned home, she called to offer me a membership at a gym near our home so I could return to the classes I loved. I was thrilled. After some discussion with my husband, I also signed up to work with a trainer once a week, but the gym required that I sign a one-year contract. I remembering staring at my signature on that piece of paper and feeling cold sweat run down my back -- what on earth had I done? I stuck with my appointments with my trainer and did my best to work out three times a week for an hour each time. I'm not going to lie: there were weeks when it was all I could do to drag myself off to the agony I knew was waiting for me at the gym. I tried to convince myself that it was a nice break from the kids (which it was, in a way). I bribed myself with a Diet Coke from the barbecue joint next door every time I finished a workout. It was hard, hard work, but I'm so happy and proud to say that I did it. I really did it. And when I signed that paper, I honestly didn't think that I could. My trainer did the math for me tonight. Over the past two years since I had Mouse, I've lost 71 pounds -- 51 of them in this year at the gym, along with 10% of my body fat and 50.5 inches off my body. Somehow the journey of health this year feels closely tied with my sewing career, as I started quilting just a few months after I started at the gym. Both activities have done so much to save my sanity and help me grow. I still have lots work to do, but I can't tell you how much better I feel than I did a year ago. I'm a little bit frightened to go back to working out at home, scared that I'll fall back into my old ways. My family assures me that they're not going to let that happen. Recently I read an incredible book called Why We Get Fat by Gary Taubes, a scientist who takes a fascinating look at the topic on the cellular level. This book was a revelation to me, and I feel like I'm finally starting to understand why I am the way I am when it comes to my health. It's given me direction when it comes to my eating as well as that of my children, and we've made changes as an entire family that are already bearing fruit. I'm hoping that the year ahead will bring better health to all of us. More than anything I want to help my children avoid so many of the struggles I've faced in this area, and nothing makes me happier than seeing them running fearlessly around the back yard or happily picking herbs and vegetables with my husband in our garden. I dearly hope that I can help them build great habits and be an example to them of a life well lived . . . in every way. Linking up to Tuesday at the (Herbal) Table. When I saw that Rachel was having a Nursery Versery contest, I really wanted to play along. I was an early holdout from buying the new Heather Ross fabric line, but after a few weeks of shuffling prints in and out of my online shopping cart, I finally took the plunge. Once I saw them in person, I was so glad that I did. This collection is just so sweet, and I think the grey prints are toned down enough that I can get away with using them on something for me. My girls were hoping I'd make a project for them first -- Bunny loves the little piggies, Bear loves the spider, and Mouse and the mice were made for each other, of course -- but after much thought, I decided to use the fabric to make myself a patchwork apron to wear around the house. For my pattern, I used the basic instructions for the apron in Suzuko Koseki's Patchwork Style. This is such a pretty book -- I love poring over the pictures again and again. Unfortunately, the library's going to want their copy back soon, so I'm trying to make my favorite projects before it's due. This apron caught my eye the first time I saw it. I've always loved the ease of half-aprons, and this one has a great row of quilted pockets that will hold anything I could possibly want to carry around with me. The main body of the apron is made out of grey linen. I used a bunch of my favorite scraps to construct the long quilted pocket, including pieces of all four Nursery Versery prints. It was a nice change to do a little improvisational scrap placement. I really should do more of these kinds of projects. The quilted pocket is lined with Dancing Meadow in yellow from the Beauty Is You collection. It's actually divided into five different pockets of varying sizes, and the quilting makes it super comfortable to wear. I made the ties a little differently than the pattern suggested, folding the long piece of linen in on itself rather than giving it a backing. Thinner straps are easier for me to tie, and the linen made them sturdy enough to hold up the apron without any trouble. The apron is lined in a yellow Bouquet print from Flea Market Fancy. For a touch of whimsy, I sewed in part of the Nursery Versery selvage strip for a "label." I love the way it looks against the lining fabric, and that little spider is so very cute. Linking up to the Nursery Versery Contest at Stitched in Color. Go check out the other entries. I promise, you'll find cuteness galore! I've been thinking back to the beginning of my sewing career, and I'm pretty certain that I've never sewn anything for a boy before. That changed this weekend. My grandparents were visiting us from back east, and it turns out that one of my cousins is expecting a baby boy this week. I started this quilt on Saturday night and finished it Sunday afternoon, working on it in short spurts between meals, church, and other family activities. It was a hectic timetable, but I was so glad to be able to finish it in time to send it along. I wasn't sure that I had any fabric on hand that would work for a boy's quilt until I remembered the charm pack I've been saving from Ellen Luckett Baker's Quilt Blocks collection. I pulled out a few squares and started playing around with them on a background of Kona Coal. It's only a simple plus pattern, but I love the way this turned out. These prints remind me of gears and architectural diagrams, so I'm calling this quilt "Structure." The quilt is backed in more Kona along with another one of the Quilt Blocks prints, and I bound it in a green and white squiggle print by Rashinda Coleman-Hale from Cute Bots. I would have loved to do more with the quilting, but I just didn't have enough time to do more than outline the formation in the center. As it was, I ended up hiding out in my room for almost an hour on Sunday trying to sew on the binding as fast as my fingers could work since they were leaving the next morning. I have at least one other friend expecting this fall, so there will be another baby quilt in the works soon. This next one is supposed to be a girl, though, so I shouldn't have any trouble finding fabric that will work. It sounds like you're all having a great time working on your blocks too. I love seeing your pictures in the Flickr group. Stop by if you have the chance and leave some nice comments! This week's project for the Zakka along is a pillowcase which features a pocket for a darling little bear. I really wanted to do this one, but I knew that I had to tweak it a bit too. My leftover scraps of Madrona Road were perfect for this piece -- I really am in love with that collection. I enlarged the pattern to make Mr. Bear about 50% bigger than the original -- a better size for my girls. He's made out of leftover grey fleece from the scarves I made for the kids last winter. I also did a zig zag stitch on the tummy oval, which should hold up better with the amount of handling this little guy is going to get. The diamonds on the prototype are beautiful, but I just didn't have the time to invest in something quite that detailed this week. I love the Madrona Road herringbone prints, so I decided to echo that in the pocket design. The idea of a pillowcase is a great one, but I know my kids...five minutes of trying to sleep with Mr. Bear right next to their heads, and someone would have been complaining about it. So I used 12" x 12" squares of Kona coal to make a little pillow so that he gets a bed of his own. The pocket was also 12" long, and I probably should have added another inch in length onto that -- it's a bit of squeeze to get him in there. At least this way I know he won't fall out easily when the girls tote him around the house. No piping on mine -- again, lack of time -- but I'd really love to try this with piping around the outside edge of the entire pillow. All in all, this was a fun little set to make. This one is for my own sweet Bear. You should have seen her eyes light up when I first handed her the finished Mr. Bear. She immediately held him up to her cheek and squeezed him in a hug, her face just glowing with happiness. And once again a project is worth every minute it took. A friend of mine is moving up north to start a new job. I wanted to make her a little something before she left, so I put together this clutch with some fabrics from my Melody Miller stash. The red and aqua color combination is always a favorite with me, and these clocks are so fun. I used the dimensions of the Uptown Clutch pattern from Bags: the Modern Classics as my guide, though my version looks completely different from the original which you can see on the cover of the book. A new bed quilt for Bunny. Yes, I know I just finished her Castle Peeps quilt this summer along with ones for the other girls too, but guess what happens as soon as you make bed quilts for all your kids? They end up growing into bigger beds, of course! My parents are getting a new bed, so Bunny will be inheriting their old queen size. Bear just got a twin bed last month, and Mouse will move into Bunny's twin bed when we switch everything around. So now I have three new quilts to make. At first I was a little frustrated by it, and then I thought, what's the matter with me? 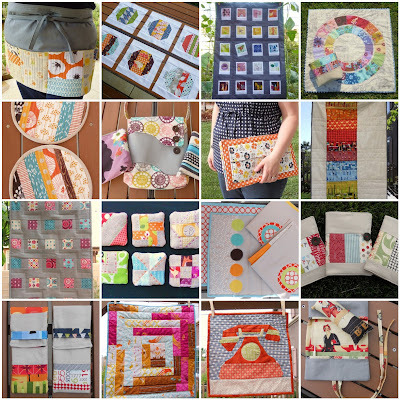 I love making quilts and now I have a great excuse to make three more! So now I'm happily planning my new projects. This is the start of Bunny's queen size quilt -- the largest one I've made so far. I absolutely love this Madrona Road fabric. It's girly but in a more grown-up way, and I think this quilt will be a good one for Bunny to use as she gets older. Today I need to finish making a clutch for a friend of mine. I should have pictures of this one by tomorrow. Little voices are calling, so I'm off to start the day. Enjoy yours!